A Narcan nasal spray can be seen in Bangor in this May 2016 file photo. 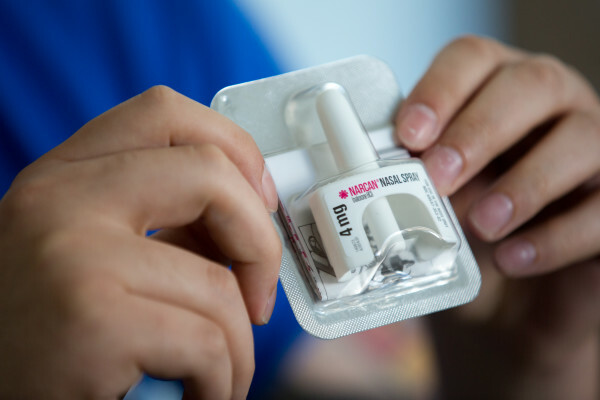 BANGOR, Maine — Four local medical centers will distribute free prescription Narcan for people at risk of overdosing on opioids next month in 500 lifesaving kits that were funded by private donations, officials said Thursday. Eastern Maine Medical Center, St. Joseph Healthcare, Acadia Hospital and Penobscot Community Health Care will be prescribing the nasal spray, which can reverse the effects of a drug overdose, as part of a Community Health Leadership Board initiative. The survival kits include instruction on how to administer the Narcan and information about available crisis services, shelters, recovery support groups and public transportation, officials said. It likely will be exhausted in three weeks, Hamilton said. “This is a real public health crisis and people are acting accordingly,” she added. The medical centers’ primary care offices, and the hospitals’ emergency departments, will be prescribing the nasal spray. Acadia Hospital will distribute the Narcan to patients within its adult outpatient services, officials said. The Narcan will go to people at risk who cannot afford to pay for it. According to the Maine Department of Health and Human Services, 8,627 Mainers received medication-assisted treatment through the department’s Office of Substance Abuse and Mental Health Services and MaineCare in fiscal year 2016. However, only 215 slots were available for those without insurance, the department said. “We are just trying to save lives. Some people are seeking treatment, but there isn’t any available yet,” said Mary Prybylo, CEO at St. Joseph. As of September, 286 Mainers had died of drug overdoses in 2016. Sixty-four percent of those deaths involved illicitly manufactured opioid drugs, including heroin, according to the Maine Emergency Medical Services, which is part of the Maine Department of Public Safety. One Narcan dosage costs about $75, and many potential overdose victims need two, Hamilton said. Narcan works by temporarily blocking the brain receptors that respond to opioids such as heroin, thereby allowing someone who has overdosed to begin breathing again. The drug is non-addictive and not harmful if given to someone who has not overdosed. The kits feature dosages via nasal spray, but the drug also can be injected. Narcan use by potential overdose victims statewide apparently has climbed dramatically over the last several years. According to Shaun St. Germain, director of Maine Emergency Medical Services, 647 doses of Narcan were administered to 521 ambulance patients in 2012. By 2014, the number of ambulance treatments climbed to 1,103 doses for 888 ambulance patients. In 2016, 2,247 doses went to 1,791 patients, St. Germain said Thursday. Those numbers don’t represent Narcan administered by police, firefighters or personnel in hospitals. Community Health Leadership Board members will likely measure the success of their efforts by seeing how fast all the kits go, how many less overdose deaths are reported, and whether the program draws more donations, Hamilton said. “We hope that as we continue to raise money [and make kits] and more treatment slots are created, the need for the kits would decrease over time,” Hamilton said. The $17,000 came from a variety of donors, including the St. Joseph Healthcare Foundation, which helped start the social media fundraising campaign Circle of Caring in May 2016. Working with the Circle of Caring, people around the region were encouraged to post photos on Facebook of people gathered in circles — to show the community uniting around those experiencing addiction — and to donate to bangorchlb.org, officials said. The Circle of Caring is representative of an effort by area medical, government and social service providers to create a seamless assembly line of treatment for all stages of addiction, Hamilton said. This year the group is pursuing the expansion of access to treatment, revision of opioid prescriber protocols, creation of a detoxification center and continuation of educational efforts to reduce the stigma associated with drug addiction. Local clergy and faith-based groups have contributed substantially to the fundraising effort, Hamilton said. “All those groups have been coming together now for a couple of months and they have been learning about addiction because they recognize that it is a big problem for their congregants, so I think they will continue to help us with donations,” she said.